Today’s post is certainly about life stuff, especially if you are a parent, but simple, it is not. Or at least it is not simple to this mama who OVER analyzes everything. Let me give you a little a lot of background. N has a weather project due for his 2nd grade class on Thursday. He has to display the information and give a presentation. He chose hurricanes. He could not wait to get started. He worked on this project for several days with the guidance of his “project loving” dad. He taught N the finer points of how to do all the prep work. Of course, the whole time, N just wanted to get to the creative part. The hubs taught N how to gather and write down information from his sources (books and the web). He then proceeded to instruct him on how to write the information on its own Post- it. 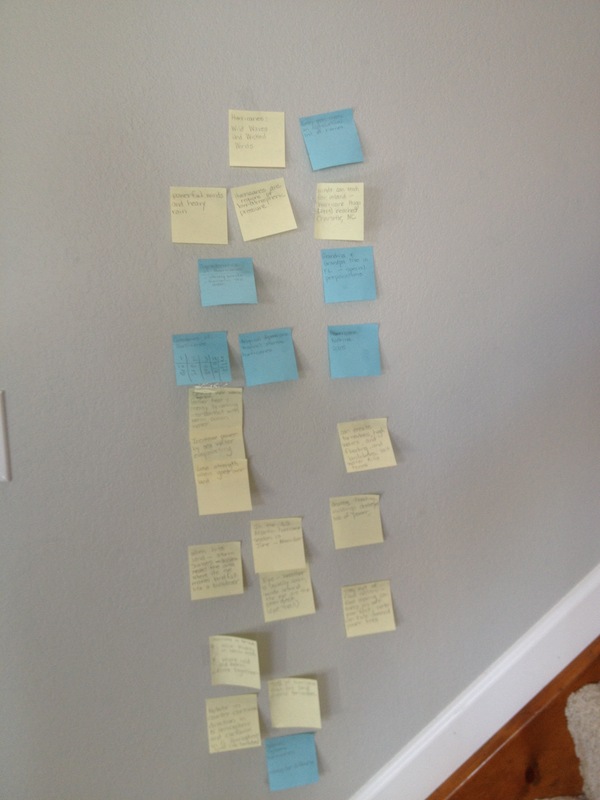 N then placed the Post-its on the wall in the order in which he thought made the most sense. So far, so good. To make a somewhat long story short, we printed out photos to place on the display board. I typed the information N wanted to go along with his pictures on the board based on the now infamous Post-it notes. We organized the pictures and information, and we glued. N is still excited at this point. Of course, as a perfectionist, my brain is, “What the Hell? The word Hurricanes should take front stage.” “Why is Hurricanes just crammed on there and bleeding over into your typed text?” “Why is it not capitalized?” As a parent, I take a deep breath and I tell him that, “I really like the big, blocked letters, and the colors and that the title is perfect.” Then, I have to be honest with him and give him the dreaded BUT, “Honey, the word hurricanes should have been first and the biggest word.” “After all, your whole project is about hurricanes.” He agreed with me, but got that discouraged look on his face and professed that he no longer was excited about the project because he messed it up. My brain starts churning and my heart hurts just a bit. This project reminds me of something I grapple with daily. To praise no matter what or tell the truth? Child Psychologists tell us to praise, praise, praise or kids will be discouraged, depressed, feel like a failure, scared to try new things, have low self-esteem. But what about honesty and teaching life lessons? We don’t always get it right the first time. If it is worth doing, it is worth doing right. No one is perfect. Everyone makes mistakes. We just try very hard not to make the same mistake twice. If we don’t teach them these lessons, life will slap them in the face one day. Do you always praise your child to boost their egos and self-esteem and to keep them motivated and willing to take chances? Do you give them the praise even though they haven’t earned it? Or do you teach them important life lessons and tell them the truth? As a parent, I would like to strike a balance. So, do I cover part of the title, the messed up part, with white paper and have him try again, or not cover it and leave it alone? I think that he already saw his mistake as he was writing the word (before you said anything to him). He saw that it wasn’t going to fit so he sized it down to get it in. It is very age appropriate for children to do that and go through that learning stage from a handwriting standpoint. 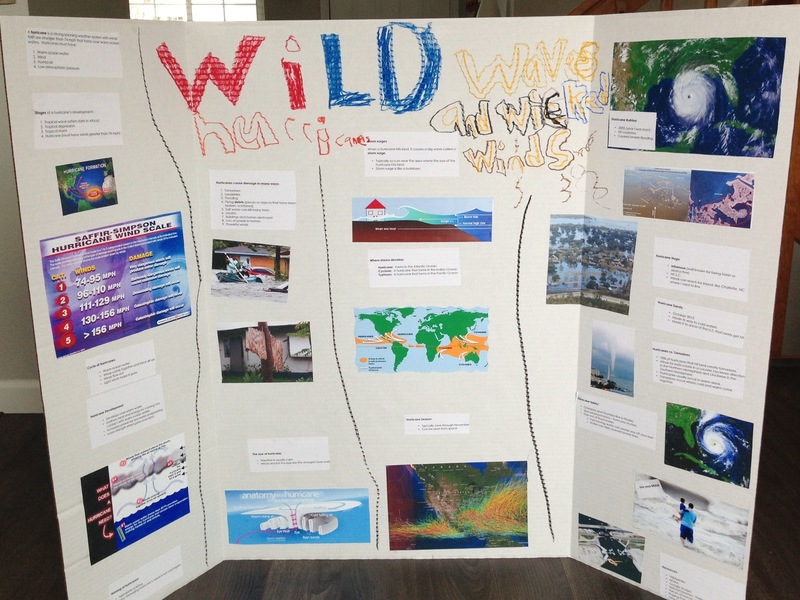 I think from a second grade boy viewpoint, he already knows that his project was on hurricanes. He just wanted to get across that they were WILD:) lol. I think you should let him choose if you cover it over and do it again. In my opinion it looks like a lovely second grade project. Gina…You know the words “age appropriate” are good for my heart and my stress level. I, too, think the word Wild was more appealing to his boy mind than Hurricanes. I will take your advice and let him choose whether we cover or not. Now, on to practicing the presentation. I told N that you loved his board, and he flashed that big dimpled smile. The boy does like him some praise. Thank you, my dear friend, for your comments. Miss you! You know my thoughts would be the same if it were Ethan’s project. I’m slowly learning to let go and let him take the lead. He just had to do a project on the Taj Mahal and while I would have liked it to be a little neater, he was proud and that made me proud. I would also give him a choice of to cover it or not. If he chooses not, embrace the wildness! Good luck with the presentation! Hi,Stephanie. Thanks for the advice. I have always been pretty good at letting N explore and discover cool things, and be creative in his own way. However, for some reason, when it comes to school work, I expect so much. I guess we have to realize our boys are growing up. So glad E was proud of his project. I just became disheartened when N said he was no longer excited. I will definitely let him choose to cover or not. Tell E we miss him terribly. I’m the same way with school work too…I want it to be perfect. I want Ethan to want it to be perfect, but I also need to keep reminding myself that my definition of perfect is not the same as his. Man, this parenting thing is hard sometimes…a learning experience all the time. I’m sure his excitement will return and I have no doubt he will rock his presentation too. Tell N I showed E the picture and he said it was “totally awesome” and he misses him too! You are so right, Stephanie. I have to remind myself sometimes that he is only 8. I told N this morning what E said, and he beamed from ear to ear. I think Gina’s answer is perfect. I’m sure the teacher will be looking at the contents of the project, the time and effort he put into the report. The title should be of his choosing. I agree with Nicklaus, Hurricanes are “WILD” so maybe the title is correct after all. Tell him Grma loved seeing the report and would give him ” + +’s” if she could grade it for him… Micah and Melanee keep up the good work.. I told N what you said, and of course he flashed that big smile. He practiced his presentation last night and is very pleased with his work. We are so very proud of him and are thankful each day. So cute! It is hard not to just take over! I nominated you for an award! Come to my blog to check it out! Amy, thank you so very much for the nomination. I will get right on that! I am enjoying your blog very much and owe you for the push to start mine. An update…N opted to have me cover up the word Hurricanes. He rewrote it and said his presentation went very well. Thanks for the advice. Glad to hear all worked out well!